I'm always willing to try a new twist on an old favorite, so I was excited to see the cover photo of the November issue of Everyday Food. I have yet to make a recipe from Everyday Food that I don't like, so I knew this twist on Shepherd's Pie would be excellent. And I wasn't disappointed. 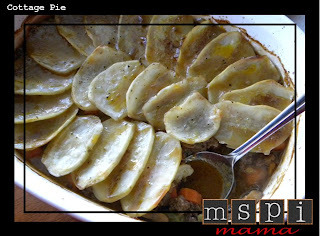 The filling is super tasty, and the roasted potatoes on top add a lovely crispness that you obviously would never get with mashed potatoes. Plus, this recipe cuts way down on calories by eliminating all those heavy mashed potatoes! And although I haven't tried it, the magazine said this recipe can be made with leftover Thanksgiving turkey. Just replace the meat by adding two cups of finely minced cooked turkey along with the peas. Yum! And speaking of holidays, this would be great for St. Patrick's Day. See my tip below on how to make it even more Irish. Preheat oven to 400 degrees. In a large skillet, heat one tablespoon olive oil over medium-high heat. Add onion and carrots and cook, stirring often, until onion is soft, about five minutes. Season with salt and pepper and stir in tomato paste. Add meat and cook, breaking up with a wooden spoon, until almost cooked through, about three minutes. Add thyme and one cup beef broth and bring to a boil. Cook, stirring frequently, until slightly reduced, about two minutes. Sprinkle flour over mixture and stir to combine. Add the remaining beef broth and cook until mixture thickens, about two minutes. Stir in peas and season with salt and pepper, to taste. Transfer mixture to a two-quart baking dish. Top with potatoes, overlapping slices. Season potatoes with salt and pepper and drizzle with two tablespoons olive oil. Bake until potatoes are browned around edges and tender when pierced with a knife, 40 to 45 minutes. Let cool 10 minutes before serving. Tip: Want to make this for St. Patty's Day? The original recipe uses one cup dark (porter) beer (or try using a stout like Guinness) and one cup water instead of the beef broth. Thanks for the recipe! I made it last night and it was delicious. The only problem with it (for us!) was the thyme, when I make it again I will use less. It was delicious other than that! Thanks for the recipe! We just loved it. This has such a comfort food feel, but to me, tastes so much better than a beef stew. The potatoes on top are great too. We loved this dish. Even my 4 year old ate it without complaint! I used Italian Seasoning because I didn't have thyme on its own, and it was delicious! I also used the Unsalted Kitchen Basic Beef Broth. I was out of tomato paste & used 4 Tbsp. of tomato sauce instead and let it cook down a touch longer. I honestly make this at least twice a month. My variation is ground turkey and chicken broth. My 16mo babe eats two bowls every time!